One of the things I miss most about not working outside the home is the business trips to Southern California (or SoCal for those of us well-versed in the local lingo). I LOVE California, especially south of LA. If Henry came home from work today and told me that we had to move there, I think I could have everything packed in less than a day!! When I made the move from Pennsylvania to New Jersey, I was grateful to find a similar beach culture to that of SoCal. 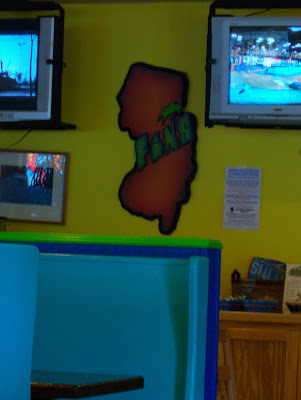 The surf culture is prevalent here in Jersey. 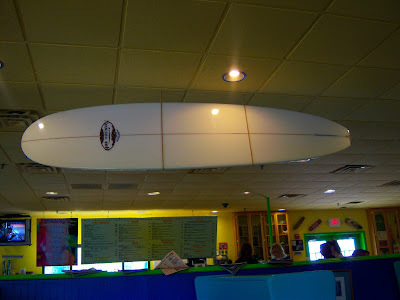 Along with the surf shops which sell boards and clothes, are a handful of restaurants which specialize in "tropicali" cuisine. Tropicali is defined as Southern California cuisine influenced by Latino, Tropical Island and Pacific Rim Flavors! Yum. 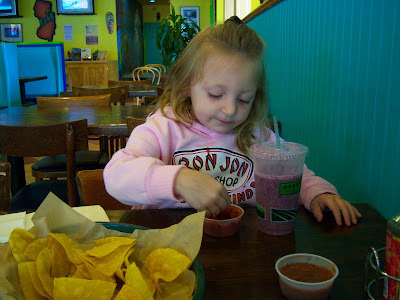 Harper and I stopped at Fins recently to get one of their famous smoothies, but while there we indulged in a salsa sampler with chips, too. Check out the decor...seriously, can you tell we are in New Jersey? Looks like Cali or possibly Hawaii!